I have never been happy about Facebook, a social networking company that originally catered to the social society of university students, becoming the behemoth that has blurred the lines between business and social networking. Typically, socio-economic groups have tended to keep their business and social lives separated. You can no longer do this thanks to Facebook and it's network of members who decided for everyone that your social and business life are one and the same. I certainly agree that Facebook capitalized at the right time and produced a modern communication medium that caters to the social existence of people. But I strongly believe that business and pleasure activities need to be separated otherwise emotions can invade smart professional business decisions that should be decided logicallly instead of emotionally. Linked In, on the other hand fills the void that would be left by Facebook if they chose to just support the social aspect of peoples lives. Linked in provides opportunities for like minded professionals and people of similar ilks to interact professionally in an environment centered around business and employment. I have been a member of LinKed In since it was founded. It is the original business networking site, in my opinion. It would be fun to hear people opinions on this. We completed a project today for a customer that has had major difficulty finding anyone to install a suitable locking system to their custom made file cabinets. These rather expensive cabinets had conventional drawer slides found in most cabinet hardware but had no space in front to adequately install locks. We used Bilock Push Locks (pictured above) because these locks include longer bolts that protrude from behind and installed these into the side wall of the cabinet. We were required to extend the length of the bolts using 4mm x 30mm long metric machine bolts (that screw on to the end of the bolt) to enable the bolts to extend into the wall of each drawer. I suggest few other installers wanted to work with these cabinets because they are very expensive and custom made, meaning any mistake could be costly. Suffice to say, we completed the project in a little under 4 hours and the locks look and operate great. The customer can only lock and unlock the drawers with the key, so locking the keys inside is just not possible. Being Bilock, the keys cannot be duplicated by anyone other than us. In the case of lost keys or extra copies, we maintain all Bilock key systems using professional master keying software and systems. All keys are coded with their system number enabling future key requests to be fulfilled by cutting original keys to their corresponding system number. 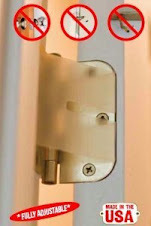 Being Bilock, these locks are truly bump proof and virtually pick proof. Combined with the inability to duplicate keys, make this product a true access control solution at economical cost. A Safe Homes International has recently released some exciting new upgrades to the Strikemaster II Pro line of Door Frame Security products. 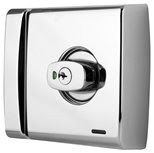 We have been selling this terrific product, well over 4 years now and have installed numerous units to people whose homes have suffered a break in due to door frame casing failure. The updated product line, now includes a patent pending model designed to secure french (double) doors. Also included in the line is a Door Edge Pro, designed to further strengthen the mechanism on the door edge. These simple, yet ingenious improvements further bolster the product line and to top things off - they have reduced the price for these fabulous products. In this economy, where many manufacturers seem to be increasing their prices for their products, when the market is still suffering from economic sticker shock, along comes a quality inventor/manufacturer who releases product at lower pricing. The incidence of break & enter is increasing across the world, as shown in our periodic crime statistics posts. Strikemaster products are purposely designed to offer the protection you need at a fraction of the prices that other makers want to charge. Beware of copy cat products. Strikemaster products are proudly designed and manufactured in the USA. 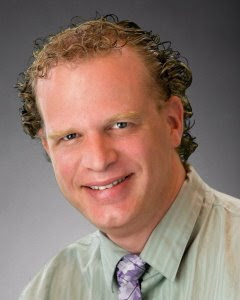 View their new website in the source below for explanation videos and demonstrations of the new products. We recently received our first sample of this brilliant device. It is simple to install and provides the intended security for the application. The unit is installed to the body of the bin, with the catch installed to the lid. 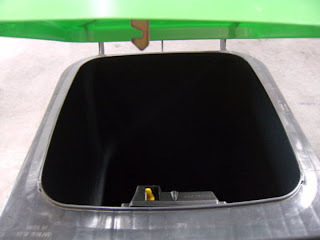 When the bin is picked up by trash collectors, the trucks will use their special grips that lift the bin and invert it so that the lid falls open and the trash escapes into the waste collector. The action of inverting the bin, causes the gravity spring inside the lock unit to "fall" to the side, unlocking the catch. When the bin is returned to the ground, the reverse action returns the lock to the "locked" position. This product would be well suited to medical centers, hospitals, clinics, pharmacies, trash collectors etc. The medical fraternity would benefit because you can safely dispose of syringes and used medical apparatus' and be assured that unauthorised use of the bin is avoided. 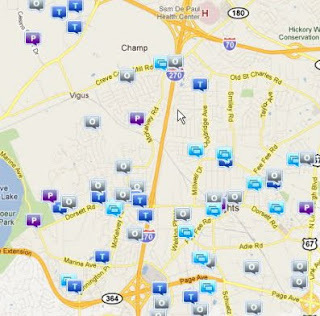 Here is a map of the incidents of crime reported in the Saint Louis, MO neighborhood of the 63146 zip code, for the period September 1 - 14, 2011. Many incidents can be avoided if consumers are proactive in protecting their properties. 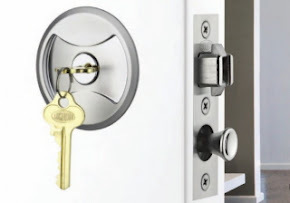 Locksmiths have deliberately trained in installation and service of suitable devices aimed at minimizing incidents of property crime, theft etc. 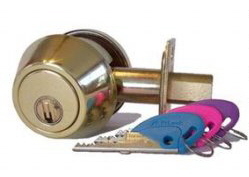 If you are serious about suitably protecting your properties and families, your first port of call should be your local locksmith. Many consumers choose to shop at the big box hardware stores today. In reality, it is rare that you will find experienced and knowledgeable locksmith and physical security tradespeople, that can recommend appropriate solutions, in those environments. If your security and peace of mind is important to you, wouldnt the advice of an especially trained locksmith technician be of more value to you than the average shop assistant? Assa Abloy Asia Pacific - Lockwood Products recently update their iconic 001 product line. This leading product in the Asia Pacific market can be found on more homes and commercial offices than virtually any other product in the region. The new product is made to the very exacting requirements that the consumer market demanded. The 001 is a surface mounted RIM product. Essentially secured to the door with six (6) fasteners. The strike plate (keeper) is secured to the door frame with five (5) fasteners. The use of this many fasteners significantly increase the strength of both door application and frame (jamb) virtually preventing the door from being kicked open. The use of modern electronic controls, updates the product in line with many competing products worldwide. Simple to operate and classically designed, this updated edition of the iconic 001 will become the new norm in the residential and commercial entrance door market. We return from abroad with a renewed vigor. More new products to be reviewed in coming posts, will focus on products designed to wet your whistle. Stay tuned.